1. October blues: U.S. stock futures were looking weak Thursday after markets started the new month with a big decline. 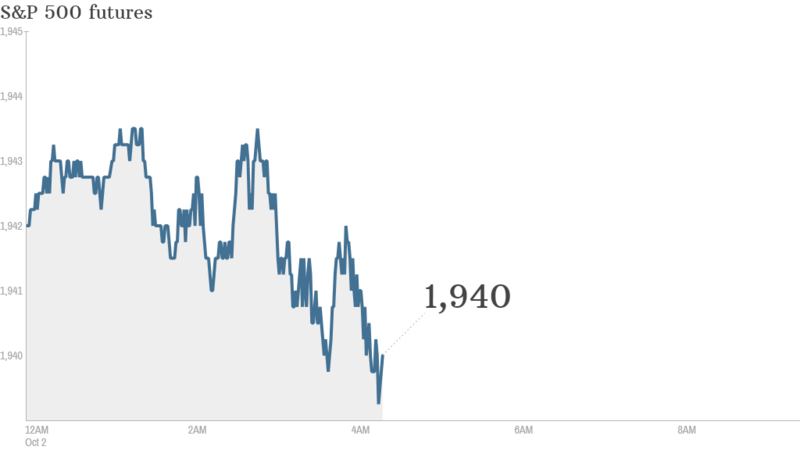 The Dow Jones industrial average lost 1.4% Wednesday, the S&P 500 fell 1.3%, and the Nasdaq was off 1.6%. This comes after all the major indexes posted declines for the month of September. The latest reading on the CNNMoney Fear & Greed index shows investors are feeling extremely fearful, just weeks after the major benchmark indexes were hitting record highs. Unrest around the world and slower growth is hurting sentiment. 2. Getting ready for the ECB: Investors are keen to hear from the president of the European Central Bank, Mario Draghi. He holds a news conference in Italy at 8.30 a.m. ET after the central bank's monthly meeting. Interest rates have been cut as low as they can go but markets are eager for more detail on an ECB program to buy some private sector loans -- announced last month. Pressure is building on the ECB to go all-in with a Federal Reserve-style program to buy government bonds as some of Europe's largest economies falter. However, most analysts do not expect any new initiatives Wednesday. The eurozone economy has stalled and inflation is the weakest it has been for nearly five years. The major European markets were declining in early trading. 3. Tesla tease: Tesla (TSLA) CEO Elon Musk put out a tweet last night saying his company was set to "unveil the D and something else" on October 9. Investors and car lovers were caught off guard, with many now expecting Tesla to reveal a new Model D car, alongside its Model S and Model X. But people are still guessing what the mysterious "something else" may be. Tesla shares were edging higher ahead of the open. 4. Market mover: Shares of DirecTV (DTV) were rising in extended trading after the NFL said it was giving the satellite provider rights to continue carrying its popular NFL Sunday Ticket package for another eight years. 5. U.S. economic data: The U.S. government will post weekly jobless claims at 8:30 am. ET.